The supply of steam sterilizers and washer disinfectors with demineralized water from a MELAG water treatment unit not only brings cost savings, but ensures the best-possible decontamination quality in a practice and clinic setting. The use of high-quality water guarantees optimal value-retention of your steam sterilizer, washer disinfector and instruments. This compact water treatment unit supplies MELAG steam sterilizers with high-quality demineralized water via the ion exchange principle. The two-chamber system of MELAdem 40 provides an especially high level of performance. Generates large quantities of demineralized water through the ion exchange principle to permit the best-possible cleaning outcome. The MELAdem 53 is ideally-suited for the supply of MELAtherm 10 and further steam sterilizers. A high-performance water treatment unit for connection to washer-disinfectors and further autoclaves. The low height of the MELAdem 53 C makes it especially suitable for compact installation situations. The reverse osmosis procedure makes for an economical and sustainable performance. The large volume of demineralized water which MELAdem 47 generates permits the connection of multiple steam sterilizers and the manual removal of water via a tap. High-performance and economical operation is ideal for Cliniclave 45. Especially resource-efficient water treatment makes the reverse osmosis unit the best possible supplier of large steam sterilizers. The MELAdem 56 can be integrated in the floor unit. For supplying distilled water, fast and economically. This practical water distiller produces water of the highest quality in accordance with what represents one of the oldest methods of water treatment. Easy-to-use, the spray pistol takes up demineralized water to perform thorough rinsing of the instruments following manual disinfection. Various adapters can be connected to MELAjet. Sustainable instrument protection against poor water quality. Reliable and precise inspection of the quality of demineralized feed water using the conductivity meter. A water treatment unit is connected to the water supply in the decontamination room. Tap water is subject to a reverse osmosis or ion exchange procedure to produce demineralized water. Demineralized water, also called feed water or aqua dem, is required for the operation of a steam sterilizer. A washer disinfector can also be operated via a water treatment unit. Given strongly mineralized tap water, the final rinse with demineralized water prevents stain development or surface alteration of the instruments in practice and clinic. The requirements placed on demineralized water are stipulated in the European Standard DIN EN 13060 Appendix C.
The use of aqua dem is very important for decontaminating instruments in a medical or dental practice. Using water of an insufficient quality can result in deposits on the instruments and the chamber of the autoclaves or washer disinfectors. MELAG water treatment units confer a number of advantages: providing value-for-money, it is an environmentally-friendly and highly effective method with which to produce demineralized water of a constantly high quality. 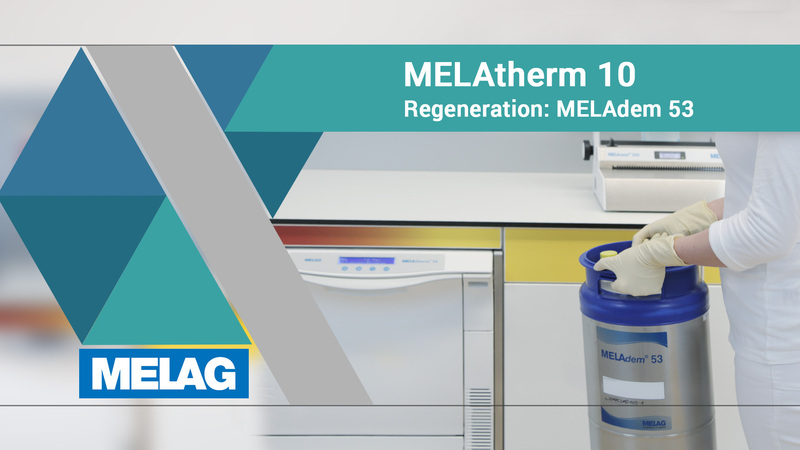 MELAdem 40 is a compact ion exchanger system for your practice autoclave. With a capacity of c. 210 l (at a water hardness of 10°dh) we recommend this water treatment unit for the supply of a steam sterilizer which is put into operation up to three times a day. The MELAdem 40 bracket enables it to be fitted in the immediate vicinity of or directly next to all MELAG steam sterilizers. Find out more about the advantages of MELAdem 40. MELAdem 47 is a reverse osmosis unit for practices and clinics with an increased sterilization requirement. The unit provides an especially efficient and environmentally-friendly method of water reprocessing. The high capacity of up to 1,900 l (at a water hardness of 10°dh) guarantees the simultaneous supply of multiple practice autoclaves. The valve included in the scope of delivery enables the removal of demineralized water for other purposes. Find out more about the advantages of MELAdem 47. MELAdem 53 and the more compact MELAdem 53 C work in accordance with the ion exchange procedure and are highly suited for use with the MELAtherm 10 washer disinfector. Using water from this water treatment unit, the final rinse with demineralized water performed by washer disinfector ensures the protection and care of your instruments. The high-performance of this water treatment unit (reprocesses up to 2.800 l at a water hardness of 10°dh) ensures flexible operation. Used together with a water distributor, MELAtherm 10 and three further devices for instrument decontamination can be connected. For example, two MELAtherm 10 washer disinfectors and two steam sterilizers with high-quality demineralized water can be supplied from a single MELAdem 53 cartridge. The scope of delivery of MELAdem 53 and MELAdem 53 C contains two cartridges. One cartridge is in operation at any one time. The second cartridge is a spare to be connected when the first is sent for regeneration. An Order form for the regeneration of the MELAdem 53 and MELAdem 53 C is available as a download. Find out more about the advantages of MELAdem 53. MELAdem 56 and MELAdem 56 M are reverse osmosis units for large steam sterilizers. Aligned to the requirements of the Cliniclave series, these water treatment units fulfil stringent drinking water supply protection requirements. MELAdem 56 and MELAdem 56 M are fitted with an especially large storage container, which together with the water treatment unit can be fitted in the floor unit of the respective large steam sterilizers in order to save space in your decontamination room. Find out more about the advantages of MELAdem 56 and MELAdem 56 M.
Use the MELAjet spray pistol to draw demineralized water directly from the water treatment unit MELAdem 40, MELAdem 53 or MELAdem 53 C and to fill the stand-alone steam sterilizers or for other purposes. This obviates the time-consuming need to procure and dispose of aqua dem containers. After manual instrument decontamination, the MELAjet can also be used to rinse the instruments thoroughly using a point jet or a cone spray. This is reliable in removing cleaning fluids and disinfectants from the instruments. The use of further Luer-Lock adapters mean that even hollow body instruments can be connected and checked for passage. The integrated conductivity measurement with which MELAG autoclaves and washer disinfectors are fitted performs an automatic check of the water quality before every program start. Given direct removal of the demineralized water, this check can be performed using the MELAtest 60 conductivity meter. MELAtest 60 determines the precise water quality within a measuring range of 0.1 to 99.0 Microsiemens (µS/cm). The Bacteria filter for MELAdem 47 water treatment unit ensures microbiologically-faultless water. The micro-fine filter effects a further significant reduction in the bacteria content of the water. Increased demands placed on the microbiological quality of the demineralized water by medical clinics practising minimally-invasive surgery will be served by using the bacteria filter. Those using a water treatment unit or steam sterilizer with a fixed water connection benefit from the extra security provided by the MELAG water stop. Water egress from the device causes the interruption of the water inflow. Installation of the MELAG water stop helps to locate leaks, thereby avoiding water damage.